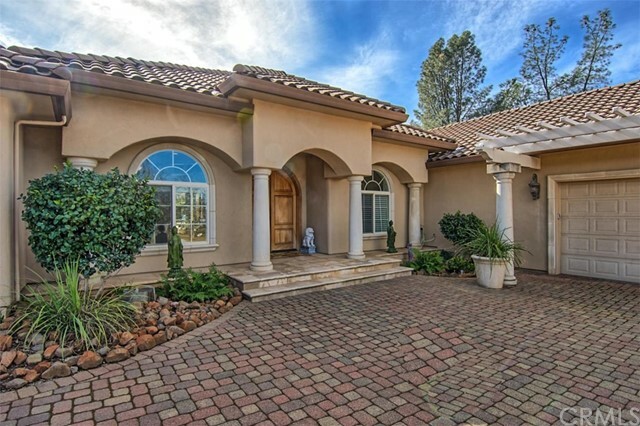 "This unique estate near Palo Cedro provides 3 separate parcels that combine to create a 43+ acre hidden oasis with over 3600 sq/ft of living space. This one-of-a kind home features a split floor-plan, gourmet kitchen, coffee station, office, workout room, formal living room & great room, dining room, heated in-ground pool w/ waterfall, 4 car garage, workshop and RV parking. Ammenties include Master suite with white bamboo flooring, his & her closets, a spa-like master bath, gourmet kitchen adorned with dual Wolf Ovens, Wolf Cook Tops, large built-in Sub Zero refrigerator/freezer, granite counters, travertine, cathedral ceilings, dual a/c, whole house fan, and covered patios. The home also includes a complete outdoor kitchen with a built-in grill, pizza oven, sink, and refrigerator, surround sound throughout the home, advanced security system, tank-less hot water heater, and a 42 panel maximum allowable solar array. This is a Once-In-A-Lifetime opportunity to live in luxury in a rural setting."